“Then will the eyes of the blind be opened, the ears of the deaf be cleared; then will the lame leap like a stag, then the tongue of the mute will sing” (Is 35.5-6). “Preach the Gospel at all times,” St. Francis is supposed to have said. “When necessary, use words.” There’s no hard evidence that the Troubadour of Assisi actually uttered this pithy phrase, but it’s the kind of thing you’d expect him to say, for Francis was all about putting faith into action. But tradition also has it that Francis was ordained a deacon, which meant that he was trained to preach, and preach he did. He preached to the public, he preached to his followers, he even preached to the birds when nobody else would listen. Clearly St. Francis saw the value of preaching with words. He just matched those words with deeds. Francis’s model for this, of course, was our Lord himself. Jesus spoke about healing and reconciliation, and he brought them about. It’s what we see in this Sunday’s readings. Isaiah had anticipated that the Messiah would do things like give sight to the blind, hearing to the deaf, and speech to the mute – and Jesus proclaimed his fulfillment of Isaiah’s predictions (cf. Lk 4.21). There’s a deeper meaning here beyond the fulfillment of prophecy however. By restoring hearing and speech to the man, Jesus also presumably restored to him his place in the social order and his ability to be gainfully employed – that is, Jesus also healed the man’s dignity as a human person. Even deeper still, however, there’s this: The healing that the man in today’s Gospel received would allow him to hear the Good News and then respond by proclaiming it himself, and in that he is a model for us today. We, too, want to hear all that Jesus would have us hear in the Word, and we, too, want to be full-throated witnesses to that effect. Such was also the ardent desire of Bl. Pierre Bonhomme, a French priest, evangelist, and founder whose feast is ordinarily observed today (September 9). Born and raised in Gramat in the Diocese of Cahors, Fr. Bonhomme returned to his hometown after his ordination in 1827. He was a devoted pastor and tireless preacher, but he also extended himself to those at the fringes of society, particularly the sick, the elderly, and the poor. He established charitable and educational institutions, and recruited others to assist him in these works. In time, he succeeded in founding a religious community of women dedicated to such efforts, the Congregation of the Sisters of Our Lady of Calvary. So, here’s Bl. Pierre, following in the footsteps of his Lord and Master, striving to match word with deed, and suddenly he lost his voice – right in the middle of preaching a retreat. He prayed for relief through the intercession of Our Lady of Rocamdour, to whom he had a special devotion, and he received a miraculous cure – just like the man in today’s Gospel. Yet later, in 1848, he lost his voice again, and this time no amount of prayer brought it back. He was “obliged to give up preaching,” reads the Vatican’s biography, but the “priest did not despair; he trusted in God’s providence and believed that this would afford him the opportunity to dedicate himself to the flourishing congregation he had founded.” That is, like the Franciscan aphorism, Fr. Bonhomme kept right on preaching, even though he’d been deprived of words. In fact, his experience gave him a special awareness of the needs of the disabled, which resulted in his fostering new institutions to serve the deaf-mute population. Fr. Bonhomme died in 1861, and Pope St. John Paul II beatified him in 2003. The Congregation he founded still thrives today, with sisters serving communities around the world, and they look to Bl. Pierre as their patron. Additionally, and maybe ironically, he is also deemed a patron of preachers, despite the fact that he lost his voice – not once, but twice. Cloistered communities dedicated to prayer, like the Trappists and Carmelites, are a great gift to the Church and certainly have their place – indeed, a privileged place. But most of us, like Bl. Pierre, are called to remain active in the world, preaching the Gospel daily, one way or another, loud and clear. A version of this reflection appeared in the bulletin of St. Joseph Church, Mishawaka, Indiana. Blessed are you poor (Lk 6.20). As it is, our secular new year begins with an even more significant and propitious feast on January 1: The Solemnity of Mary the Mother of God. It marks the last day of the Christmas Octave, and it focuses our attention on Mary’s unique role in our salvation, but also her role as our heavenly mother and advocate. Moreover, since 1968, our Popes have designated January 1 as the World Day of Peace. We’re asked to offer special prayers that day for an end to war and violence, and to reflect on how we can all help bring that about. But let’s say, just as a thought experiment, that the Church decided to align its fiscal timetable with the timetables of the world’s mightiest powers, both political and corporate. That is, what if the Church’s financial calendar started in October instead of January? What lessons could we learn from such a shift, especially if the underlying liturgical calendar was left intact. Considering the wealth of feasts in the first week of October, I’d say there’d be plenty to chew on – particularly with regards to how differently the Church views money matters relative to how the world views them. Anyway, with regards to my little experiment, here’s what I came up with. October 1 (Fiscal New Year): St. Thérèse of Lisieux. What better saint to ring in the new financial year than this youthful Carmelite and Doctor of the Church. Her whole life was dedicated to self-denial, hiddenness, and her Little Way – the total opposite of the world’s obsession with consumption, self-aggrandizement, and bigger-is-better. As E.F. Schumacher said, and St. Thérèse lived, “small is beautiful,” and we’d do well to imitate her example according to our abilities and state of life. October 2: Guardian Angels. The second day of our Catholic fiscal new year coincides with our annual reminder that we each have a spiritual being assigned to us by God – and that on Jesus’ own authority (Mt 18.10). As with other angels, our guardian angels are God’s messengers, but they also can act on our behalf, protect us, and promote our welfare. In other words, their whole purpose is to serve us – to serve others, not themselves. Would that we held a similar perspective with regards to our wealth, and that we strove to increase our selflessness in our generosity and giving. October 4: St. Francis of Assisi. Here’s the showstopper for my Catholic fiscal new year: The patron saint of voluntary poverty. His rejection of worldly wealth and prestige in exchange for temporal deprivation and derision was considered madness in his day, but he sparked a revolution of love. Not everyone is called to live his radical life of downward mobility – someone has to pay the bills, after all, and have enough left over to pass along to those who beg alms – but his appearance at the start of our imagined financial calendar would set a spiritually profitable tone for the whole year. In the interest of brevity, I’ll have to skip over other relevant saints in that first week of October – like Bl. Francis Seelos, a Redemptorist missionary to the U.S., on October 5, or the founder of the Carthusians, St. Bruno, on October 6. Besides, we don’t want to stretch this idea too far. However, there is one more coincidental date that makes this thought experiment especially timely now. Our next would-be fiscal new year’s day, October 1, 2017, will fall on a Sunday – Respect Life Sunday, in fact. It’s a fortuitous confluence of observances that comes every seven years or so, and if it were to also mark financial day #1, think of the unmistakable message if would transmit regarding what the Church truly holds dear: not market share or stock price, balanced books or cash reserves, but the intrinsic and absolute value of every human life. Look at that. A little allegory of the soul. The kids outside the parish center were frantic. I was dropping off my own children for an activity, and those already there had spotted some birds trapped in a window on the second floor. Sure enough, in addition to the agitated living birds, a few tiny bird skeletons were also visible in the enclosed window sill – obvious evidence that this was a recurring problem. The parish center’s windows are original to the building, but the storm windows were added much later, and they aren’t exactly a tight fit. That second-story window is a case in point: There was a gap between the two lower sashes, large enough to allow small birds to clamber in, but not quite big enough for them to spread their wings and escape. I urged the kids to settle down, and I told them I’d go up and take a look. It seemed to me that it would be pretty easy to pull down the upper sash, and then reach over to raise the outside storm window in order to set the birds free. Needless to say, like so many of my “seems-pretty-easy” plans, this one hit a snag. It seemed like time, humidity, and dirt had all ganged up to ensure the immobility of that upper part of the window. It was stuck solid, but with the kids all clamoring below, I felt like I had to do something. “Maybe if I just tapped a bit around the jamb,” I thought to myself. “It might loosen it up enough to open.” Tap, tap, tap…. The aging glass pane broke out suddenly, and multiple fragments fell to the bushes below. Fortunately, the children were positioned well away from the side of the building in order to better observe the rescue, so no one was hurt or even endangered. Nevertheless, it was a big surprise, and we all froze for a moment. The chirping birds still imprisoned between the lower panes woke me up, and then I realized the accident afforded me an opportunity. I reached through the broken glass, pulled up on the storm window, and the birds fluttered away. Cheers erupted below, and, for a moment, I was a hero – a bird hero! Funny thing, though, I hadn’t set out to be a bird hero, but rather to calm the frazzled nerves of an assembly of bird enthusiasts. Plus, my mission was only accomplished accidentally, and if the pane hadn’t broken, I’m not sure what I would’ve done. The rescue was accomplished, nonetheless, and the children, consciences at peace and satisfied with the dramatic dénouement, returned to their activity. I cleaned out the rest of the broken pane as best I could, stuffed a rolled up mat in the open gap, and headed downstairs to pick up all the glass fragments from the shrubs. It will come as no surprise that I cut myself in the process. Later, driving home with my family, the whole episode was thoroughly reviewed. “That was awesome,” Cecilia exclaimed. “All the kids think you’re a super-dad!” The praise was flattering, but I demurred, reminding them that the window broke by accident. “It’s funny, t hough,” remarked Joan, “Will predicted it in a way.” Young William, a passionate bird fan, apparently had insisted that “releasing the birds is the most important thing,” even if it meant breaking a window. Bird=soul; transparent enclosure=sin; struggling with stuck window sash=our futile human efforts. And the shattering glass? A sign of God, of course, unexpected and unprecedented, mowing down whatever gets in the way of our salvation – petty habits, selfishness, pride most of all. He smashes and pulverizes, if it’s required. The gates of hell will not prevail! Yet we complain: Broken glass is dangerous – we get cut, we bleed, we risk infection, severe hemorrhage, death! Isn’t there another way? No! Smash the enclosure! Free the captives! Let them all flutter away! It’s like Will said: Releasing the birds is the most important thing. Even if it means breaking a window. During Advent, every Christian is a Mary-worshiper. Naah, just joshing you. Not even Catholics worship Mary, despite appearances to the contrary. We pay her tribute and honor her – even reverence (dulia) her in a singular, intense manner (hyperdulia). But worship (latria)? That’s reserved for the Persons of the Trinity alone. 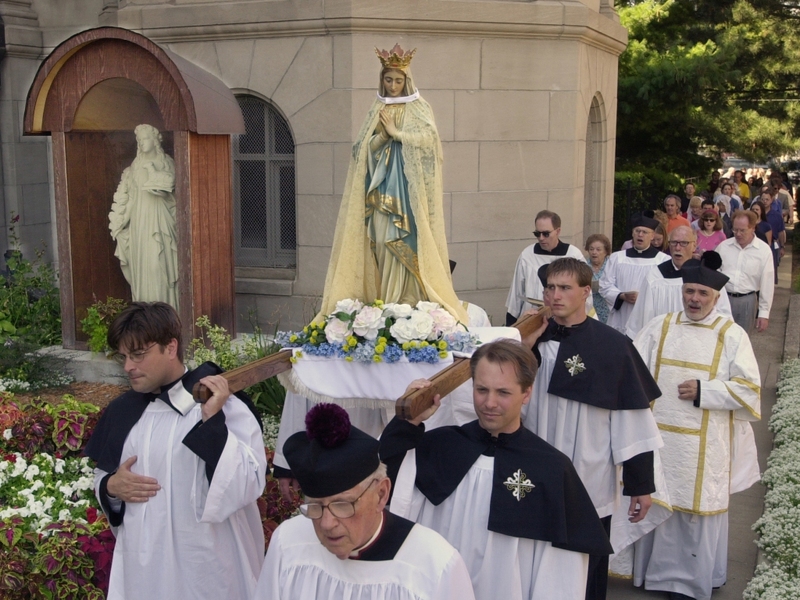 Our hyperdulia can get pretty darn close to latria I suppose – Rosaries and icons and processions and statues, et cetera – and it’s understandable that outsiders might get confused. Let’s set the record straight then. Mary is not God – she was a human being. Immaculately Conceived, to be sure, but a human being in need of Christ’s redemptive sacrifice as much as anybody else. That being said, the Ecumenical Council of Ephesus (AD 431) did bestow on her the title Theotokos – mother of God. It was a way of combating Christological heresy, but also a way of putting into words what the whole Church had long embraced and celebrated. As the mother of the incarnate God, Mary shares His flesh – in fact, it could be rightly said that He shares hers. She played a unique role in salvation history, she continues to play a role in the life of the Church today, and we are devoted to her as any child ought to be devoted to his earthly mother. If Catholics had been left to their private judgment, to their personal religious experience, to their sense of the essential spirit of Christ and Christianity, to any of the liberal or latitudinarian tests of truth, they would long ago have exalted our Lady to a height of superhuman supremacy and splendour that might really have imperilled the pure monotheism in the core of the creed. Over whole tracts of popular opinion she might have been a goddess more universal than Isis. Still, it’s a truism that virtually all Christians, Catholic and otherwise, honor Mary in their homes this time of year, even going so far as setting up a statue of her in their homes – sometimes more than one! You know what I mean. It’s only brought out this time of year, and it’s usually in the context of a larger Nativity set (or several). Elaborate crèches feature Jesus, Mary, and Joseph at the center surrounded by shepherds and sheep, magi and their servants, an angel, and a host of farm animals that would be the envy of any homesteader. Simpler Nativity sets might include just the Holy Family and a single shepherd with sheep, along with a single representative Wise Man – or maybe just the Holy Family and a crib. And the simplest? The Occam’s Razor of Christmas decoration? Mary and her baby. That’s the essence of Christmas. Jesus, the Son of God, is always the central character in these miniature figurine dramas, as He should be. But consider that rarely is the baby Jesus depicted without His mother – unless you count all those gaudy images of the Infant of Prague, with the frills and the trappings and the lace. Even then, Mary’s presence is felt, because who else but a mother would dress up an infant boy like that? Oh, but it’s all just Nativity sets, right? Practically toys, or possibly family heirlooms that have been passed down over a couple generations or more. They’re just illustrations of a Bible story in which God the Father is the primary actor. No special credit is meant to be given to Mary just because her image is on display. Yet, skittishness about excessive Marian devotions and fears of Mariolatry are part of the air non-Catholics breathe, so you’d think there’d be at least some hesitation about Nativity scenes – but there’s none. Come November every year, graven images of Mary are on display everywhere, and nobody gives it a second thought. Sentimentality plays a part, I suppose. St. Francis set up the first life-size crèche in 1223, and we’ve been oohing and aahing ever since. But even for Christians quite conscientious about such matters, it’s a natural, healthy instinct to honor the Holy Family with a Nativity scene. To be able to see and touch Jesus, Mary, and Joseph isn’t just for kids. It’s also a tangible expression of a theological truth that is itself about tangible expression: The Incarnation. Given that the Nativity is all about making the spiritual and unseen into something – Someone – very physical and see-able, it seems only fitting, even to the most rigorous fundamentalist, that the Holy Family and the Christmas story be depicted in a manner accessible to all our senses. But perhaps there’s another element as well, one that is a bit more subtle and less readily acknowledged by our Protestant kin. It’s this: Mary is the first Christian – the first to literally accept Jesus as her Saviour. That makes her a template and model for all Christians, and it’s good to have images to remind us of her –and not just at Christmas, but year round. I pondered all this the other day when leading devotionals for my clinical group. I teach nursing at an Evangelical college that was founded primarily to prepare young people for the mission field. Almost all my students are Protestants; few of them have much familiarity with things Catholic. So I teach them. It was the Feast of Our Lady of Guadalupe, and I talked a little about Mary and her special place in our common Christian heritage. There are two Gospels to choose from that day, both from Luke. For my students, I read aloud the Nativity story itself, including Gabriel’s declaration that Mary would play a singular role in God’s wild rescue plan for the world. Instead of freaking out, Mary asks an honest question: How can that happen? – that is, how is it possible for her to get pregnant at all, let alone get pregnant with the God-man Himself? As if to reassure the young girl that “nothing will be impossible for God,” Gabriel relates that her cousin Elizabeth had conceived a son despite her advanced years. Mary’s “Behold, I am the handmaid of the Lord” was not just acquiescence to the Lord’s weird scheme, but also a signal of active engagement. She was to be no mere vessel or medium, but a determined player as well. So what?, my students might ask. What makes her any different than any other Christian responding to truth and God’s call? From their perspective, Mary is simply one in a series of biblical characters that became instruments in the hands of a God determined to save His fallen creatures. For at the moment the sound of your greeting reached my ears, the infant in my womb leaped for joy. Blessed are you who believed that what was spoken to you by the Lord would be fulfilled. Am I ready to explore how God can use my specific interests, experiences, and job skills in Bible translation? This last is especially applicable to Mary, and it connotes another point of contact for Christians of varying traditions. For, although Wycliffe is referring to translation of the written Word into various languages, Mary devoted her entire personhood – body, soul, and spirit – to ‘translating’ the Word (logos) of God into human flesh. And that’s what all Christians are called to do: Take the Jesus we receive – in church, in Scripture, in Sacrament, however that happens – and translate Him for those around us – incarnate Him again and again through our own words and actions and lives. This is why we like to have Mary around throughout the year: To jog memories of our mission and jolt us into action. This Christmas, as you put away your Nativity set, maybe keep out the mother and Child a little longer than the rest. See if their visible presence doesn’t help you remember what we’re all called to be: Pregnant couriers of Christ, just like Mary. A version of this story appeared on Oblation, a blog of the Notre Dame Center for Liturgy.